End cutter machines are typically used for cutting fabric. They allow the cutting process to be fast and accurate and are often used in a workplace setting to maximize efficiency in the manufacturing process. Most end cutters are mounted on a table. They tend to have a circular blade which is pushed across the fabric in a horizontal motion in order to make the cut. This blade tends to be fitted with a guard to avoid injury. There are two main types of end cutter on the market - automatic cutters and manual cutters. Both of these types of end cutter have their advantages. Automatic end cutter machines are amazingly fast at end cutting. They have incredibly easy operation, just load and pushing a button. These machines have other controls to change certain parameters such as the length of the cut and the height of the machine. 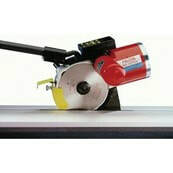 Automatic End Cutters tend to be the higher end option, making them less suited for those on a budget. However, despite the higher end cutter machine price, they do make a good investment in an industrial setting due to their efficiency. 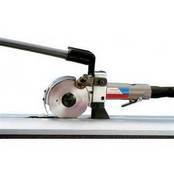 Manual end cutter machines are typically operated by hand, although they may still be partially automatic. They come table mounted, and non table mounted. They are incredibly basic in comparison to the automatic end cutter counter part. These machines tend to have a lower upfront cost, but at the sacrifice of the amazing efficiency of the Automatic End Cutters. If your a new start up with limited budget, the manual may be the best option. If you are looking to ramp up production, it is a no brainer though! The automatic End cutter's ease of use, and efficiency cannot be beat!